Being without your Lexus for any length of time can be inconvenient, that's why at Don Valley North Lexus we offer you a range of transportation options that you can take advantage of while your Lexus is in for any repairs or maintenance. Did you know we have After Hours Drop Off? Want to have your car taken care of first thing in the morning? Unable to drop off your vehicle during normal hours? We have a secure After Hours Drop Box where you can quickly, and easily drop off your vehicle for service. Simply look for the After Hours Drop Box by our Service Entrance Drive-Through, fill out a quick information form, and drop in your keys. It's that easy. For more information, fill out of form below. If your vehicle is being left for long periods, we offer a Courtesy Shuttle (see map) and an exclusive loaner car through Hertz. 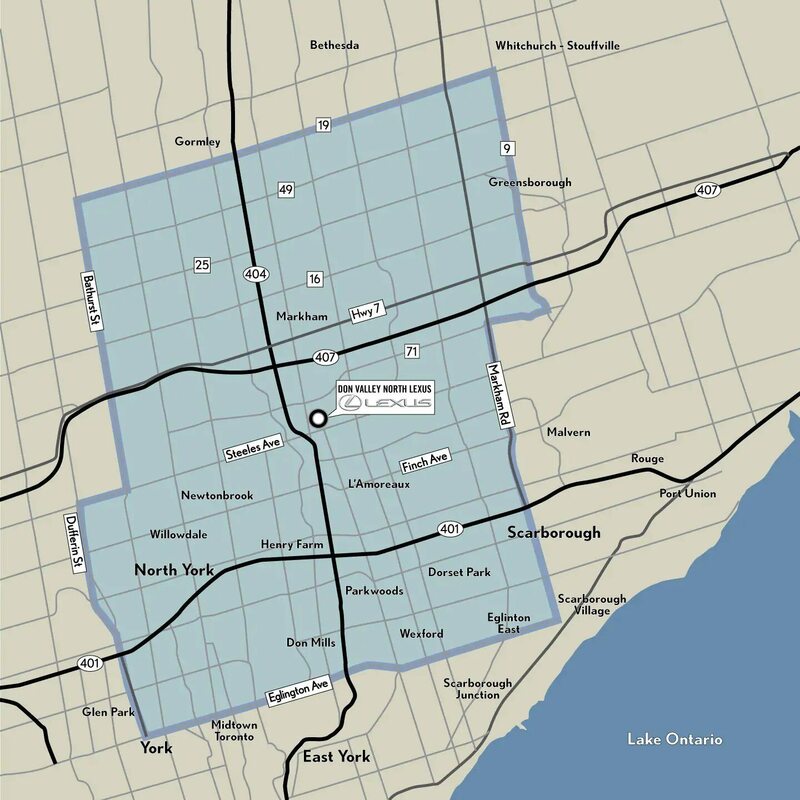 Our Shuttle Program is available within the area bounded by the thick grey line on the map under 'Shuttle Boundaries'. You drive a luxury car, so why not experience some luxury service? We will pick up your vehicle, bring it to our shop, and when the repairs are completed, deliver it back to you (with respect to required services). Our Pick Up Service is available within the area bounded by the thick grey line on the map under 'Shuttle Boundaries'.